The 1984 Europe tour starts with two show in Italy (Verona) before moving into Germany. The first concert was not a good one, here are some clips/links. He opens with the inspired choice of “Jokerman,” but it fails to match the official version..
guitar flourishes for once enhancing the mood of the song. I was at the opening concert in Verona Italy in 1984. I was wandering around the venue and came across of a couple of drunk English fellows who claimed to be roadies. they were having a problem convincing the Italian guards that they were part of the band so I stepped in and explained the situation in Italian to the guards and they let us pass. I ended up back stage with a quart of orange juice and vodka. eventually I ended up back stage for Santana with Sancious. they cleared the stage when Dylan came on so I ended up in the roadie seats just off stage for Dylan. all in all, a good time. 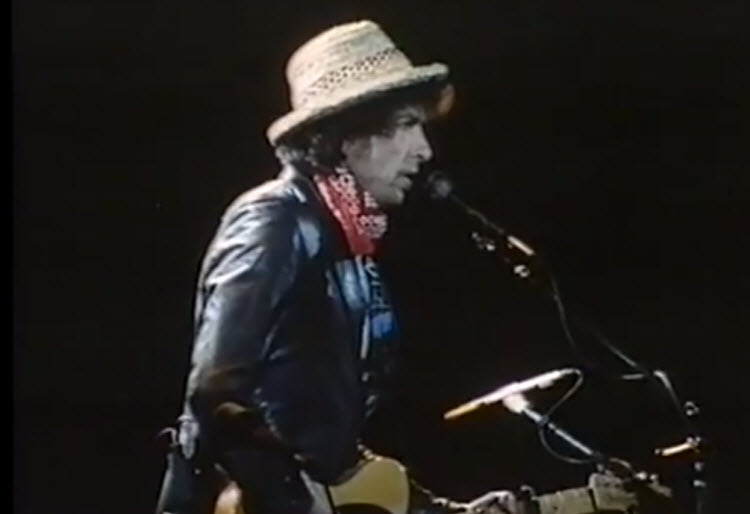 As I missed out on the tour in 78 in the Netherlands because the guy buying the tickets for him and me and my girlfriend returned with the remark that he did not buy them cause they were too expensive and than they were sold out (hell I was mad, also at myself for letting him do it), the 84 tour was the first I attended, Bob playing in the Ahoy. I had seen Hard Rain, heard the enthousiasm of those as lucky to have been there in 78 at the great legendary concert in Rotterdam, so when I saw his sloppy performance with Mick Taylor (who had managed to give some fire to the glossy Infidels) I was devastated. No I did not give up on Dylan, but I had to admit he was feeling lost, as if he did not know what to do after the christian songs… It would prove to be a long wait before he touched my heart at a live gig (though the film with Tom Petty had me raving, then when I saw them in Holland in 86 or 87 it was as bad as the tour with Santana. Mostly, in both shows, he would appear to be stone drunk, not even aware of which song was playing. Thanks for the story Hans, and thanks for all your other comments as well.